The 23rd May, 2013 came into being during a relentless autumn downpour. This was a tragedy! How was I going to walk from the Domain car park to the NSW State Library without my hair suffering ruination? How could I talk at the Sydney Writers Festival on The Forest for the Trees self-publishing panel if I looked like a smelly, old dog who’d just rolled in a muddy puddle? With my umbrella glued to my head, I walked along the Macquarie Street footpath, cursing every raindrop. Just shy of my destination, when I thought I had survived nature’s onslaught and retained fabulous hair, some jerk, from the warm, dry comfort of his motor vehicle, swamped me with a wave of wet stuff when he (I’m assuming it was a man because they are always doing silly things) drove through a massive puddle and drenched my jeans. I think I actually growled and I definitely swore. Marching on, determined to ignore my plight, I reached my destination. Okay, enough of the theatrics. I’ll get down to business now. I was honoured to be asked by the organisers of the Sydney Writers Festival (the biggest writers festival in Australia) to sit on the self-publishing panel. I love sharing what I’ve learnt in the last year and a half, with other writers who are dreaming of life as a published author and here was an awesome opportunity. Chairing the panel was the kind and knowledgable author and crowd-funding specialist, Anna Maguire. She asked awesome questions of myself and the two other authors (who were also wonderful peeps), Chris Allen and Elisabeth Storrs. 2. Interact in the social media forum where you feel most comfortable. 3. Have your book edited!!!! One of the questions was “How much does it cost?” Editors charge at different rates—I’d say as a general rule between $40-$80 an hour (depending on their experience, reputation, and workload). The quote you receive also depends on the amount of time it will take to edit your work and the word count. When I edit, if the writing is good, I can edit up to 4,000 words an hour, if the writing is not so good, it can take an hour to edit 1,500 words, so prices for a 60,000 word book could range anywhere from $750-$2,500. If your writing is really not ready for editing, the editor should tell you and not take the job. If this happens with me, I edit a paragraph and tell the author to go away, learn what I’ve explained and apply it to the book before resubmitting. A good editor won’t want to waste your time or theirs. 4. Have your book proof-read. 5. Spend time creating a great cover which is relevant to your genre or set aside a budget to pay a professional. 6. Be patient: it takes time for the word to spread about your book and you want to be in it for the long haul. 7. This is a business so treat it like one and realise you will need to invest money and a lot of time. 8. Traditional publishing is not all it’s cracked up to be. Elisabeth felt that her original publisher supported her with editing and cover, but only provided marketing and support for six weeks after her book came out. She is much happier as a self-published author and she retains all her royalties (you have to sell three to four times the amount of books as a trad published author to receive the same royalties). Incidentally, Elisabeth was so happy with her editor that she now pays her on a freelance basis to edit her self-published books. 9. You have total control as a self-published author. You can see what marketing works because you have access to your sales figures and you get paid every six weeks to three months (if your book is selling). With a traditional publisher, you must wait six months to be paid. 10. As a self-published author you have the ability to price the book to sell. I have seen many (not all) of the big publishers price their authors’ e-books out of the market because they are trying to protect their print interests. If you don’t believe me, check out some of these books on Amazon. I buy a lot of e-books for Club Fantasci and I often have to pay between $10 and $15 for an e-book! 11. The support of other writers is invaluable. Connect with authors on Twitter or Facebook because they will answer your questions about how to upload to Amazon, or who is a good editor, they will spread the news of your book sales, and they will support you with a kind word or funny anecdote on the days you receive a bad review or the weeks when you’ve hardly sold any books. 12. The credibility of self-published authors is still suffering because too many of these authors write a first draft and press the ‘publish’ button. If we want to be taken seriously, we all need to follow the professional route (ie editing, learning the craft, doing good covers) and encourage other self-published authors we know to do the same. Something we didn’t discuss on the day, as we ran out of time (we could have talked all day), was, in my opinion, the importance of learning your craft. If you can’t afford a university degree in creative writing or literature, there are many online or local courses you can take. If you live in Sydney, The NSW Writers Centre has loads of fantastic courses run by some of the most experienced and talented writers in Australia, as does the Australian Writers Centre. I predict that many mid-list, traditionally published authors, will decide to self-publish in the coming years. Why wouldn’t you if you have an established fan base and great editing/cover contacts since you will earn a lot more money? If you want your book to shine, to impress people, and to sell; if you want to survive in the new age of publishing, be professional and patient. I’m happy to say that self-publishing is no longer a dirty word (even though a lot of publishers still scoff at self-published authors) and it will continue to lose its negative connotations if we all work on doing the right thing. If you are an author considering self publishing, I wish you all the best. Feel free to contact me on twitter or through my facebook page if you have any questions on the subject. 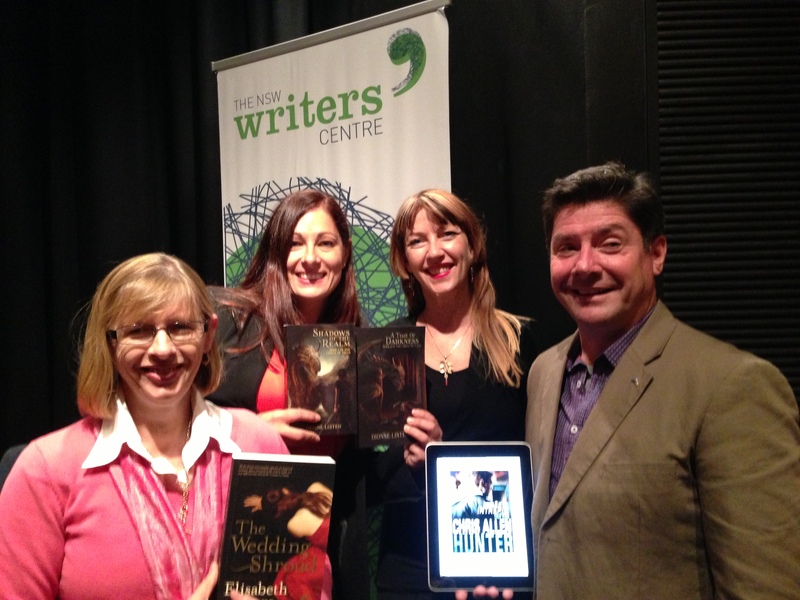 Cheers and thanks again to the organisers of The Sydney Writers Festival! While writing Shadows of the Realm and A Time of Darkness, there were times when my characters would embarrass themselves and they begged me not to include those scenes. I have, up until now, kept them secret, but I’ve decided to do a ‘bloopers’ series. This is the first excerpt from that series. Please enjoy my characters stuffing up on the job. Bronwyn, Blayke and their creaturas entered the vast dining hall. One of the long timber tables was set with a farewell breakfast. Pancakes, fresh strawberries, gozzleberries, fried bacon and the extra-large eggs of the Vellonian eagle—cooked sunny-side up—lay enticingly upon platters on the tabletop. Bronwyn breathed in. “Yum. That smells delicious.” She sat on one of the large bench seats, legs dangling, while Sinjenasta lay behind her chair, the large panther having enjoyed his haunch of venison outside earlier. Blayke sat opposite, grabbing his fork and stabbing into a pancake, dumping it into his plate before spreading a clump of butter on top. Fang, the rat, peeked out of Blayke’s pocket and took the small piece of pancake the realmist offered him. Zim, the black dragon prince, entered as Blayke shoved a forkful of pancake into his mouth. “I hope so.” Bronwyn smiled as Zim sat next to her and spiked a piece of bacon with one claw, an egg with another, popping them into his mouth. “Mmm, this is good.” Suddenly a loud rumble rolled through the dining hall. “Oops. Excuse me.” Zim’s dinner-plate size eyes looked from Bronwyn to Blayke and back again. “Oh my gods! Did you just … um, pass wind?” Bronwyn coughed and covered her mouth and nose with her hand. Wait for me said Sinjasta. Today I’m featuring a fellow Aussie author. She’s having a giveaway of both of her books and a $30 gift voucher which ends on the 19th of May. Her first book is Escape From the Forbidden Planet and the next book, Return to Cardamom, which I’m proud to say I edited :). They are great children’s to early teen books. 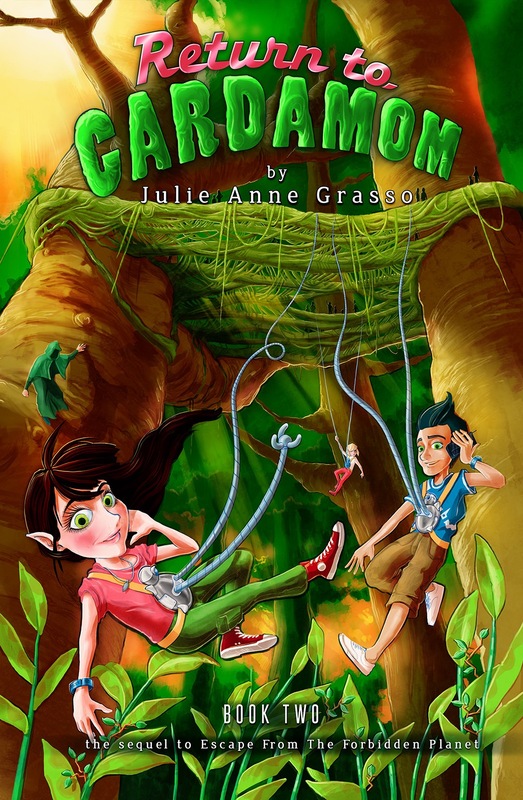 If your kids are looking for something new to read, go to Julie’s website and enter the rafflecopter now! Life is sweet for Caramel and things are finally getting back to normal. the crop or the Elves of Cardamom will lose their livelihood. makes a shocking discovery, one that will change everything. Action-packed Paranormal Romance on Sale! 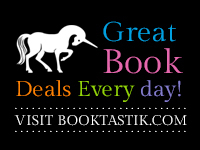 Everyone loves a sale, and, although I don’t do a lot of promotion for other authors on my blog, this is one author I’m happy to share with everyone. Charity writes fast-paced books with fantastic characters, humour and heat. If you like paranormal romance which is unpredictable, you should grab your copy now! The Society of Sinners will be on sale from 14th May, for 0.99. Snag your copy now from the following outlets, before the price increases. The quiet community of Jackson Station is where everyone knows your name and…species? 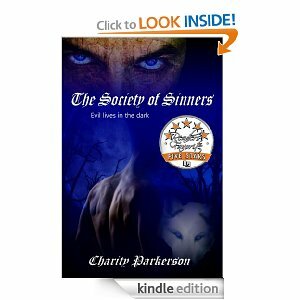 This is the first in Charity Parkerson’s new sinners series introducing a paranormal world filled with vampires, werewolves, changeling, and God’s greatest warrior. He was cloaked from head to toe in black, with black leather gloves covering both hands. His odd hair color of black, blonde, and red stood out starkly against the absence of color in his clothing. A pair of dark shades covered his eyes, hiding his true identity, but Mika was no fool; that was a trap she wouldn’t fall for again. There was a matching chair to one side of his that was separated only by a small round table. She fancied it was something an old married couple would do, kicking back in recliners next to each other at the end of a long day. She threw herself down wearily in the chair next to him. A low chuckle sounded from deep within his chest. “How do they intend to trap me?” He thought for a moment, then added, “Perhaps they think to wait until I turn into a bird, and then they’ll put me in a cage. Then I shall turn into a lion just to watch their faces as the cage is destroyed underneath my weight.” He laughed at his own description. Mika leaned back in her chair, crossing her feet at the ankles, matching Dimitri’s pose. “I do not know,” she answered tiredly. Before her eyes, his features transformed back to those of Dimitri’s and he looked at her from his own familiar face. Reaching up, she removed his sunglasses, revealing his light-blue eyes. His dark-red hair was similar to hers in coloration, and a light smattering of freckles across his nose left him with a look of innocence that caused women to flock to him over the ages. He looked like a boy of nineteen instead of a man who had lived for centuries. “That’s better,” she breathed, drawing him close to her in a kiss so hot he was left panting. 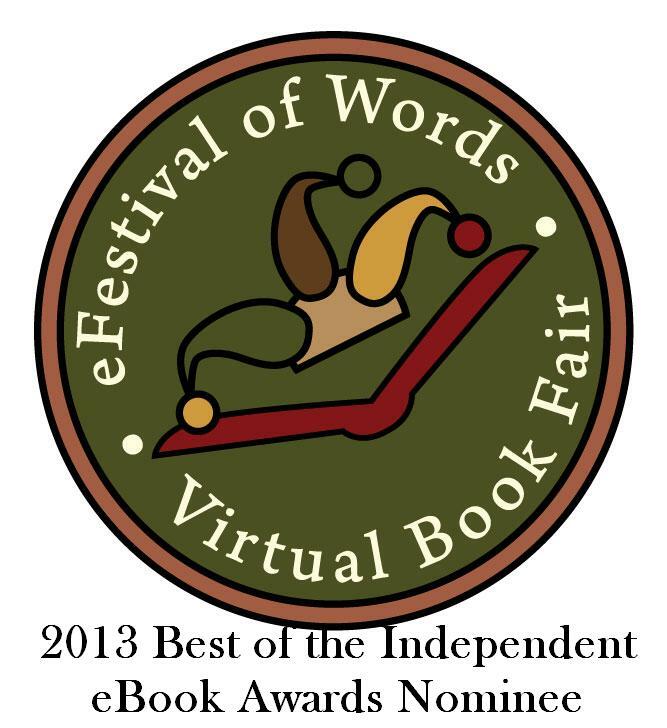 Shadows of the Realm Nominated in 2013 eFestival of Words Awards! My days just get more and more exciting. I’m proud and happy to announce that my debut novel Shadows of the Realm has been nominated in two categories in the eFestival of Words Awards. It’s an award solely (that word looks weird, solely, hmm, anyway…) for self-published authors and authors who are published with small indie presses. Shadows of the Realm has been nominated in the Fantasy and the YA categories and I’ve even been nominated for an editing award for Amber Jerome-Norrgard’s short story, David. I’ve noticed that Wool, by Hugh Howie, is in there too, so he adds some awesome cred to these awards. The books are nominated by your peers and then the field is narrowed down by hard-working volunteers who work with eFestival of Words. Then comes the scary part: on the 1st June, 2013, the final list of books is announced and can be voted on by the reading public (although you have to be a registered member of their site to vote). I’m sure I’ll be hounding everyone for votes when the time comes. Even if I’m not an overall winner, I’m so happy just to make it as a nominated author and editor. I’d also like to say good luck to all the other authors who have been nominated. I hope you’re all as excited as I am! 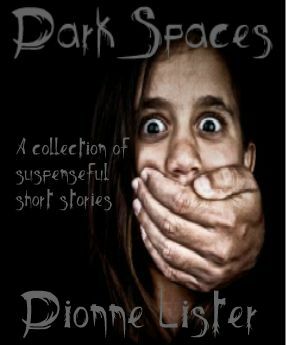 Dark Spaces—Book of Suspenseful Short Stories—on Sale! Dark Spaces is a collection of suspenseful short stories that deal with the darkness in human nature, and it’s on sale now for only 99 cents! OMG, what can you buy for 99 cents these days? A third of a coffee, ten toothpicks, one peanut? Trust me, it’s a bargain. Dark Spaces has been getting great reviews, but I’ve been neglecting promotion because my fantasy series has been begging for my attention. So now it’s Dark Space’s turn. Run out and grab your copy while it’s still 99 cents. This promotion will run for two weeks (until the 18th May, 2013). 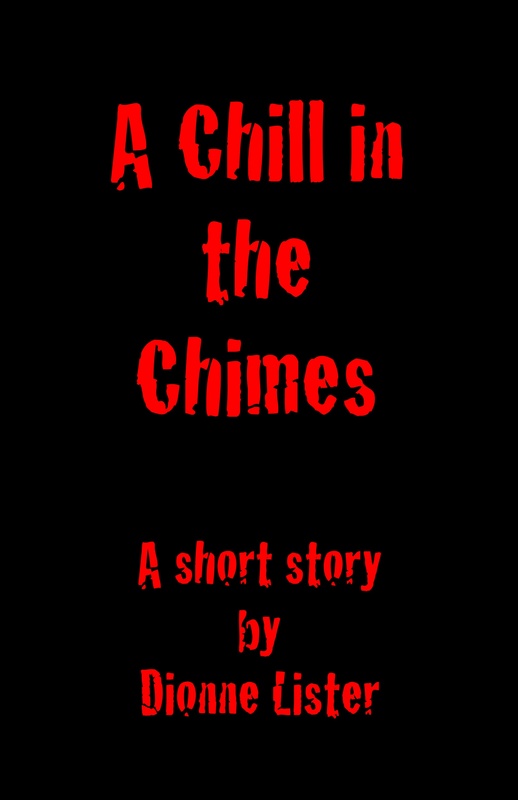 You can download from Smashwords (which has every format you could want) and Amazon. Happy reading, or should I say scary reading ;).